The recipe I found on bhg called for arugula but we have too much spinach so decided to use it instead of arugula. 1. In Dutch oven cook gnocchi according to package directions and add corn to cook with. 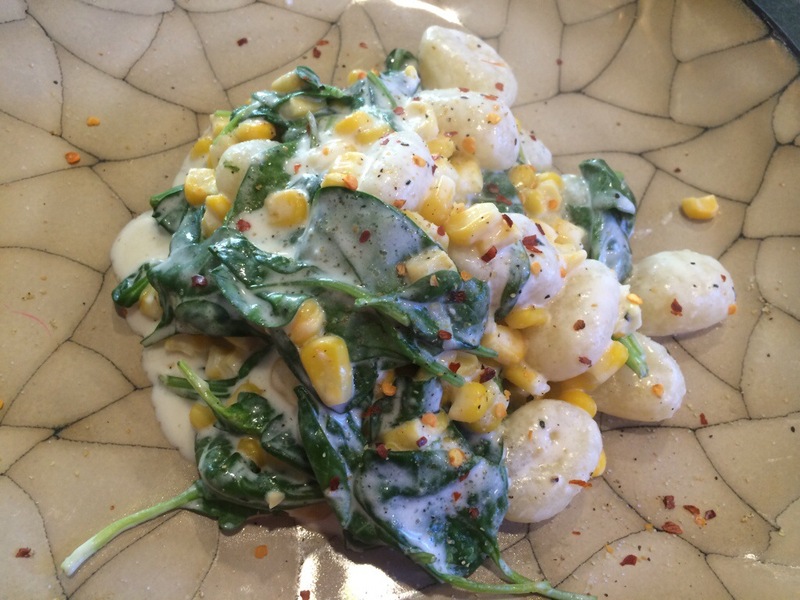 Drain gnocchi and corn kernels reserving 1/2 cup of the pasta water. Do not rinse. 2. Meanwhile, for cream sauce, in medium saucepan combine half-and-half, cream cheese, salt, garlic powder, dried herb, and pepper. Cook over medium heat for 10 minutes, stirring frequently. Stir in reserved pasta water. 3. Return cooked pasta and corn to Dutch oven. Pour cream sauce over pasta; heat through, if necessary. Stir in spinach. 4. Serve and sprinkle with additional salt, pepper, dried herb, and crushed red pepper. My 3 year old told me it smelled like baby’s diaper while my 1 1/2 year old loved it! My husband gives it 7 stars and says he likes the zing of the red pepper!